Nrityagram Dance Ensemble came to town again this week. They are one of the best dance companies I have seen, in any style, and they delivered another outstanding performance. Their control is so good, they seem to be standing still even when they are moving. This performance, Samhära (Sanskrit for collection, practice, skill, compilation, drawing together and the braid), was especially interesting because it combined the Indian dance form Odissi, which I have seen many times, with Kandyan dance, a style from Sri Lanka, which I had never seen before. 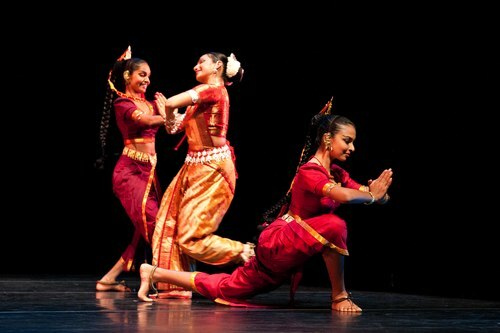 Chitrasena Dance Company's talented Kandyan dancers fit in seamlessly with Nrityagram. If they hadn't been dressed in somewhat differing outfits, they could have been one troupe. Kandyan dance seemed to be a little more relaxed in style than Odissi. The Kandyan dancers had a Momentum-ish enthusiasm for their art. Beyond this though, since the performance was a fusion of two familial styles, and since I haven't seen Kandyan dance before, it was difficult to tell where one style ended and the next began. Likely this was an effect they were aiming for, but it did also leave me hoping for an opportunity to see Kandyan dance performed on its own. I didn't doubt that Nrityagram would inspire me as they always have in the past. What I really wanted to know was how well they could inspire a love of dance in the next generation. I took my three and a half year old daughter to the 2 pm matinee. She was rapt, intently watching the dancers for nearly all of the hour long first act. At the end of each number, she clapped enthusiastically. Towards the end of the act, she started waving her hands in the air, trying to imitate the dancers' movements. This show was not advertised as being for kids, but since there is very little in dance that is accessible for kids, sometimes you have to take a chance when a show comes along with a kid-friendly start time. In the case of my daughter, it was a reasonable risk because she has seen and enjoyed abstract dance before with non-disruptive behavior. In addition, I believe very strongly that our society tends to underestimate what kids are capable of understanding so it is wrong to always segregate kids into a made for children corner of art. It is fair to say that I was not the only one at the show who feels this way. There were at least six other small kids with their parents at the show. We left towards the end of the intermission because even though my daughter said she liked the show, she wanted to go home. I had expected this. Even with great art such as Nrityagram, there is only so much sitting a three year old can handle. While we did see only half of the show, I still felt we got our money's worth, and then some. When we got home, I asked her what her favorite part of the show was. She said the dancing. She also liked the chocolate (during intermission), and the dancers' princess costumes (which is her way of saying they were beautiful). A friend of the family happened to be over, so I asked my daughter if she could show her what the dancing was like, so she got up and demonstrated a few sequences, complete with narration. I would suggest one slight adjustment to assist with kid-friendly audience development. They should add a one hour Saturday matinee. Pick any of the choreography from the main show: there is no need to change it. And then promote the special matinee to families with children. Maybe create a kids Playbill program with more pictures and less text, and some coloring book pages. This should bring in extra income as well as new audiences. It would require the dancers to do a show and a half on one day, but I have no doubt they have the strength to pull it off without strain. If Nrityagram Dance Ensemble can continue to inspire three year olds to get up and dance, they will be assured of packed houses for years to come. 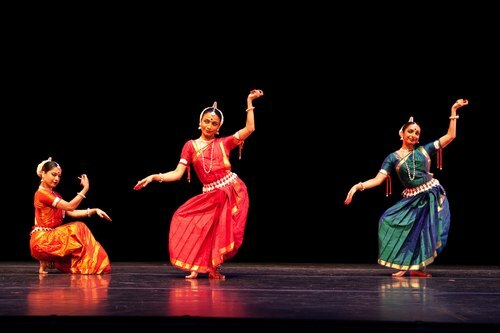 Photos are also courtesy of Nrityagram Dance Ensemble.